If you're a fan of the Justice League Animated series, this exciting Justice League Action Basic 12-Inch Action Figure Case is for you! Featuring the unique and sleek look of the Justice League Action team, this case comes with 8 of your favorite super heroes in 12-inch action form! Based on the animated series, each action figures features an enhanced power suit, a refreshed design and in some cases, a cape! These figures have 11 points of articulation, allowing you to pose them in a dynamic range of actions. 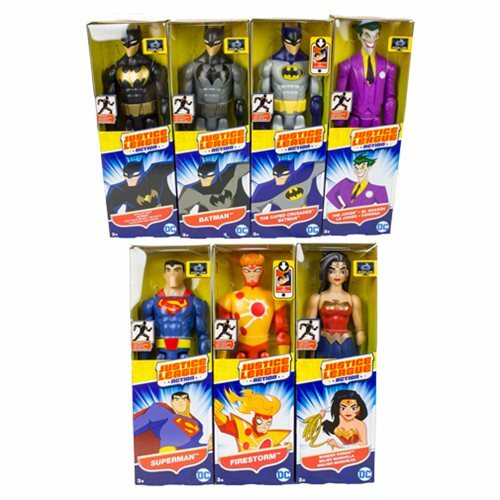 This Justice League Action Basic 12-Inch Action Figure Case contains 8 individually packaged action figures. Ages 3 and up.